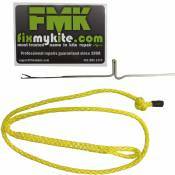 KiteFix’s best Seller! This repair package contains all you need to make permanent repairs. 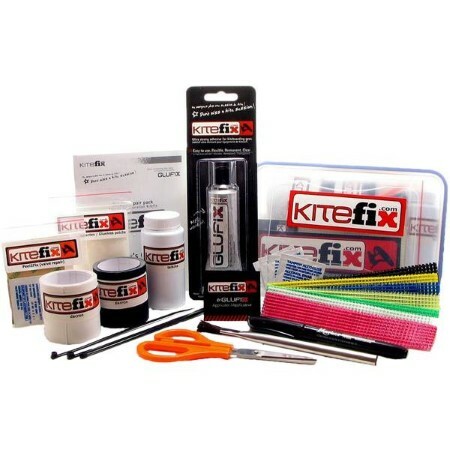 Hand assembled in Canada with high quality products, KiteFix’s repair kit is a must to be added to your equipment. Includes: 1 Glufix tube (1 oz. ), 2 self-adhesive dacron rolls (Black & White, 5’ each. ), 7 Fiberfix tapes (4’ each), bladder ultra-adhesive patches (3’’x 7’’), 1 Peel2Fix valve repair system, 1 Talkine bottle (3 oz. ), 1 Glufix applicator, 3 tie raps, 1 detailed user’s guide, 1 pair of scissors, 1 plastic bag, 1 kitefix sticker. All put together in an airtight plastic container.